A New lifestyle mall in Iskandar Malaysia is expected to become the largest in the southern region, with the potential to attract RM338 million in annual spending. With a gross retail space of one million sq ft, the mall, situated at the western development zone of Medini North, will benefit from high accessibility to Johor Baru via the coastal highway, which is slated for completion in 2012. The mall is 15 minutes away from the Second Link to Singapore, and will be connected to public transport services, including the planned Light Rail Service. It is next to the Legoland Malaysia theme park and it will start operations at the same time as the theme park. Iskandar Investment Bhd (IIB), which is overseeing the project, said the new lifestyle mall would turn Medini North into a hive of activity. 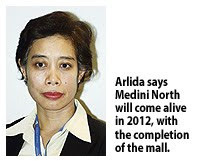 "Medini North will come alive in 2012, showcasing to the world Iskandar Malaysia's strong and compelling value proposition," said Arlida Ariff, president and chief executive officer of IIB. "Iskandar Investment is proud to have solid relationships with our current investors and will continue seeking trusted partners from across the globe to establish Iskandar Malaysia as the ultimate destination for global citizens to live, play and work," she said in a statement. IIB had showcased the lifestyle mall to potential partners and retailers during the International Council of Shopping Centers Asia Expo in Singapore from October 14-16. "This first shopping mall in Medini North, will seamlessly connect to the Legoland Malaysia theme park, hotels and commercial developments which will fulfill Iskandar Investment's vision to develop Medini as the definitive lifestyle and leisure zone in Iskandar Malaysia," said Rosenah Hassan, chief executive officer of Iskandar Harta Holdings, a wholly-owned subsidiary of IIB, which is undertaking the lifestyle developments within Medini North. The design of the mall will incorporate natural open-air landscapes, making it ideal not only for shopping but contemporary art exhibitions, live performances and international festivals. PETALING JAYA: The property sector has seen a strong comeback in the third quarter with renewed buying interest for residential property indicating that the economic downturn is “bottoming”. Datuk Seri Kong Cho Ha... 'The country’s property and construction sectors had experienced revisions to their ratings outlook. Housing and Local Government Minister Datuk Seri Kong Cho Ha said the country’s property and construction sectors, which were more severely impacted than other sectors of the economy, had experienced revisions to their ratings outlook. He said this to reporters after opening the National Property and Housing Summit 2009 here yesterday. Kong said sales on the upmarket ones in particular had been “very encouraging”. “That is a good sign of recovery of our economy, and the people are investing again,” he added. Kong credited the recovery to the implementation of the Government’s stimulus packages. Currently, there are 148 abandoned projects in the country, some dating back 20 years.Kong said the ministry had successfully revived 12 of these. Commenting on the upcoming Budget 2010, Kong said the country, like others, had faced an economic crisis in the last two years. “So, the Government has to be very prudent and plan very carefully,” he said. TA Global Bhd, set to become Malaysia’s fifth biggest listed property group, plans to double the number of hotels it owns in five years, adding to a portfolio that includes the Radisson Plaza in Sydney and the Westin Melbourne. It wants to build at least two hotels in Kuala Lumpur and make acquisitions in overseas markets from London to Canada, said Alicia Tiah, managing director and co-founder of its parent company, the Malaysian brokerage TA Enterprise Bhd. TA Enterprise, whose shares have more than doubled this year, folded all its property assets into TA Global which will be listed on the Kuala Lumpur stock exchange on November 23 to tap a resurgent stock market. The FTSE Bursa Malaysia KLCI Index has gained 44 per cent so far this year. TA Global, which now owns four hotels, is being spun off into a separate listing to realise its value and help it expand. The group spent about RM756 million (US$225 million) from December to August to buy the Westin Melbourne hotel, the Swissotel Merchant Court hotel in Singapore and the Coast Whistler Hotel in Canada, taking advantage of depressed prices during the global recession. The acquisitions will triple hotel revenue at TA Global next year, Tiah said, without giving the current figure. TA Global will have a market value of RM2.4 billion when it’s listed and will be ranked the fifth largest property group, HWANGDBS Vickers Research Sdn Bhd said in a September 29 report. TA Global, which has total assets valued at RM2.4 billion, has lined up more than RM6 billion of property development projects from now till 2012, said Tiah. The company also owns the 24-story Terasen Centre, an office building in Vancouver, Canada, and Menara TA One, a 34-story office in Kuala Lumpur. By listing the property unit, TA Enterprise will be “unlocking the hidden value” of its property assets, ECM Libra Capital Sdn Bhd said in a report yesterday. TA Global will raise RM230 million from the share sale. It also owns offices in Kuala Lumpur and Canada. TA Enterprise will retain a 57 per cent stake after the listing, said Tiah. “We have a good stream of income, good time, bad time, it will be there,” she said, referring to the hotels. “I love hospitality, you can up the rates,” as opposed to office buildings where rates are fixed by contracts, she said. The Penang Turf Club plans to build 25 bungalows on its grounds as it seeks to develop rental income to fund operations. The RM30 million development, will be sited on two separate parcels of prime freehold land totalling 2.25ha, on the fringes of the horse track in Batu Gantung. The club stands on a plot of land totalling 104ha. It will use internal funds for the development. "We are projecting a RM1.94 million net annual income from the rental of the new homes," PTC president Datuk Ong Eng Khuan told reporters after an extraordinary general meeting held at the club's premises yesterday. While the estimated development cost has been tagged at RM30 million, Ong said the projected annual return from rental as a percentage of the development cost stood at 6.43 per cent. The history of the Penang Turf Club dates back to 1864. Apart from the Singapore Turf Club, this is the oldest club of its kind in Peninsula Malaysia. The earliest horse racing turf in Penang was on a field along Macalister Road on the island. Members voted for the project, which will comprise detached and semi-detached homes, which are slated for completion by the end of 2012. "Since the lots are within an area zoned as 'established housing' and 'low density residential', the height of the proposed houses should not be more than 2 or 3 storeys," said Ong, adding that this is to ensure that the proposed development will be consistent and compatible with existing houses in the surrounding areas. The club is located next door to the upmarket Jesselton neighbourhood, which serves as one of George Town's more prestigious addresses. "The maximum density allowable for the area is 6 units per acre," said Ong, "and the development will not interfere with the running of the club." WESTON Homes plc, a UK property developer specialising in the development of high quality residential developments, is targeting Asia including Malaysia as a new growth region to develop properties, says its chief. Weston Homes operates throughout the South-East of England and London. Its chairman and chief executive officer Bob Weston said the company plans to develop properties outside the UK. "Asia, including Malaysia, is an important market to us. We would be delighted to discuss any potential joint venture arrangements with Malaysian developers," he told Business Times in an interview. Weston Homes was recently in Kuala Lumpur to promote its RM825 million Bridges Wharf project. The project is one of London's most prestigious River Thames residential development. It offers a collection of 265 one- and two-bedroom units, with built-ups ranging from 450 sq ft to 2,100 sq ft, including one penthouse built within three glass-fronted, 12-storey apartment towers. Within one of the apartment towers is a five-star 70 room French boutique hotel called the Von Essen Hotel. Bridges Wharf features 8,000 sq ft of commercial space and more than 14,500 sq ft of retail space for restaurants and boutique shops. "We are making our debut into the Malaysian investor market as the (British) pound remains weak. There is also more Malaysian interest shown in the UK and this would be an opportune time for them to own properties in London before prices move (up). We are offering great value for money now," Weston said. Weston Homes has sold close to 200 apartment units since Bridges Wharf started two years ago. It hopes to sell the remaining lots to Malaysian home buyers. The company's joint marketing agent for Malaysia is VPC Alliance (KL) Sdn Bhd. VPC managing director James Wong said it recorded moderate success during the sales exhibition on Bridges Wharf in Kuala Lumpur in October. "Some deposits were made, but they are strong leads for follow-ups. Many prospective buyers are going to London to view the development before committing," Wong said. SCIENTEX Bhd, a manufacturer and property developer, plans to buy Johline Realty Sdn Bhd for RM65.3 million to tap the growth triangle of Johor Baru. It told Bursa Malaysia yesterday that the acquisition by its unit Scientex Quatari Sdn Bhd is in line with its expansion plan of current operations from Pasir Gudang and Kulai to Iskandar Malaysia. The deal, which will be funded with internal funds and borrowings, is due to be completed in three months. CC&T Ventures Sdn Bhd, a local property company, has signed a pact with a leading construction and development company in China to jointly develop properties in China and Malaysia. The signing of a strategic collaboration agreement with state-owned Beijing Uni-Construction Co was held in Beijing recently, witnessed by the Malaysian Ambassador to China, Datuk Syed Norulzaman Syed Kamarulzaman.